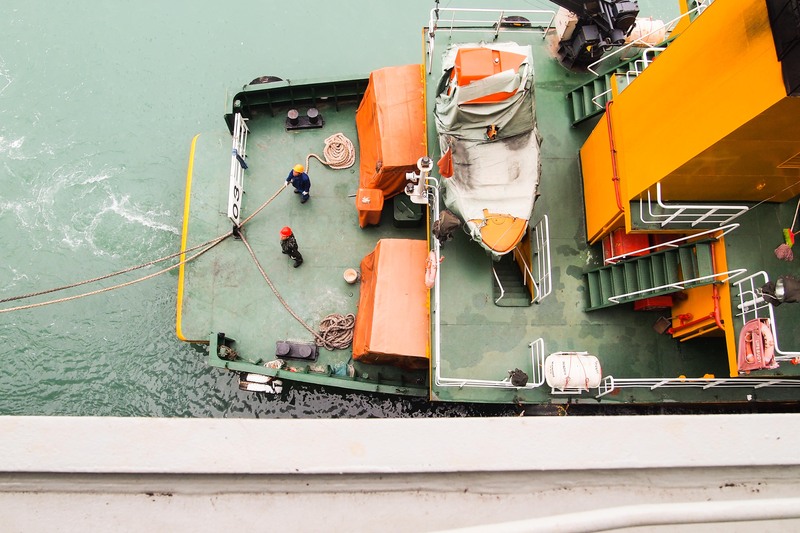 Followers of The Disorder of Things have recently been treated to several engaging fieldnotes from Charmaine Chua as she crossed the Pacific on the container ship Ever Cthulu. Here she connects logistics and waste in another though provoking post, especially if combined with Deborah Cowen’s excellent work on ‘deadly logistics’. On our thirteenth day at sea, after having been battered by 6 meter waves and snow, gale-force winds and storm, having watched the ship’s skeleton snake and bend with the force of rough seas from within the depths of its passageways, I woke up on a calm, quiet morning to a sea that had turned a lighter shade of blue. From my porthole, delighted, I watched as seagulls weaved in an out of the wind currents above the containers, seaweed merrily skimmed the surface of the ocean, and fishing vessels began dotting the horizon. Land was near. Less than a day later, we drew into the port of Kaohsiung, Taiwan. Terminals stretched for miles from two harbor mouths, the air a humid, sticky breeze, the pilot’s Mandarin accent sounding suddenly like home. The transition from sea to land has been almost too quick. After days suspended over liquid blue, spent imagining the ocean from what Derek Walcott has termed the “subtle and submarine”, the looming horizon of the sedentary state with all its territorial weight seemed almost churlish. Everything since touching land has been a blur. 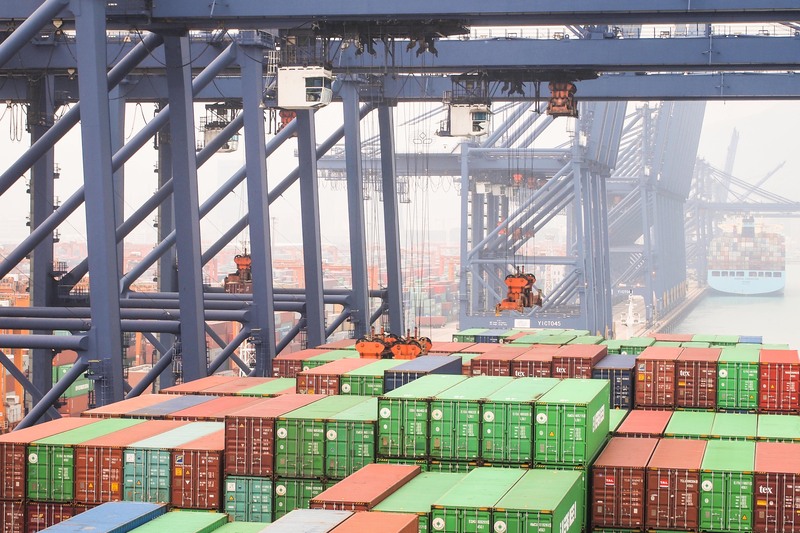 We spent 36 hours in Kaohsiung, during which a majority of the 4000 containers on the vessel were unloaded, then surged onward to Yantian, where 16 hours in port – aided by gantry cranes larger than I have ever seen – allowed not more than a hasty trip to the city center for a dinner of mushroom and chive dumplings (desperately welcomed after a six-week parade of meat and potatoes), before we set sail again for Hong Kong. Now, after a mere 15 hours there, we are in Kaohsiung once more. Tonight we leave for Taipei with four different currencies in my pocket and my head swirling from switching back and forth between two different tongues. After 42 days at sea, in less than twelve hours I will be off the Ever Cthulhu forever, never to return. In the meantime, I am allowing myself to be taken in by the fearsome, monstrous smoothness of the East Asian logistical sublime. I had expected the delays we experienced on the US west coast to have created a massive backlog in China, but we arrived to clear seas and empty anchorages. The Chinese ports have a clockwork, kinetic edge. The transitions are quick – almost blinding. 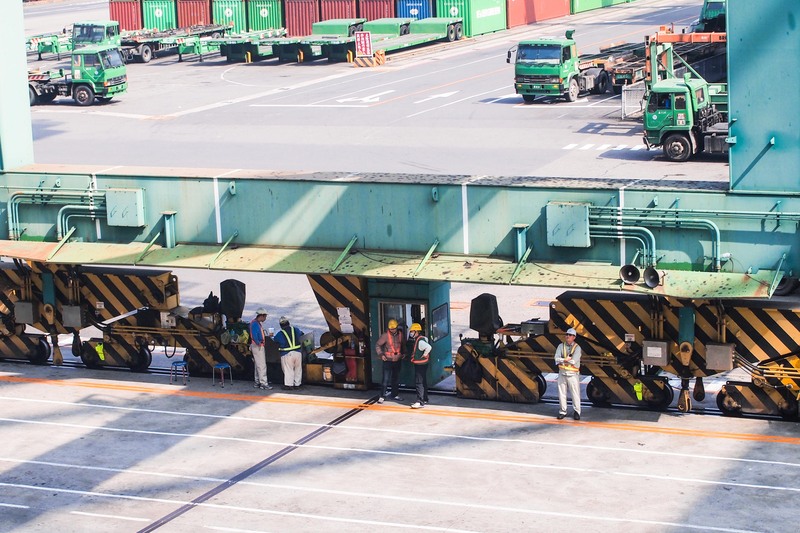 Once the ship berths, security rolls out a portable security checkpoint on the shore below, gangs of workers appear from under the towering gantries, and a rolling stream of workers climbs up the gangway. Lashings go off, trucks and straddle cranes slide into place, the agent appears, papers and loading plans are signed, and the cargo operations begin. There are no breaks, no pauses, no delays. The entire machinery of the port, already in gear, accommodates the ship in one smooth gesture. In Yantian, walking down city streets and neon-lit stores stocked to the seams with the latest fashions, I stood in a corner for a while, watching in wonder as throngs of China’s developing middle class milled about. As laughing families strolled and shopped in suits and camel coats, they emanated a certain confidence in the Chinese economy. The captain noted that none of the gleaming high-rise apartments that rose around us had been there on his previous shore visit five years before. On its worst days, the Chief mate reports that Yantian moves weight at almost thrice the speed of LA on its good ones. The port handled its 100 millionth TEU in 2013, and in 2007 became the first port in the world to reach an annual throughput exceeding 10 million TEUs. All ports race to become number one, and the cities that conspire around them become affluent reflections of this competition. Yet, while today’s urban spaces enfold inhabitants within their grand infrastructural projects, inviting us to live, work and play in new skyscrapers and squares, the port marks modernity differently. Situated on the edges of the city yet walled off from the city’s eyes, the port declares its success by proxy in ‘key performance indicators’ and throughput handling statistics, though few are there to watch it happen. We drive past their gates, read about their integral role in the health of our economies, and live around them, both benefiting from their economic success and suffering from their environmental impact. Yet few gain entrance into their inner worlds. This is perhaps why, on my way back to the ship from Hong Kong one night, I paused amidst the roar of port operations bustling even at midnight, and found myself strangely moved, feeling small and helpless in the face of these vast technological landscapes. I ran across sweeping truck traffic and stood under the colossal hull of the Ever Cthulhu for a while, measuring my insignificance in the light of its grandiosity, watching gantry spreaders rise 200 feet above my head. There was a cinematic quality to all the swish and seamlessness, an allure that made the fantasies underpinning logistics’ aspirations toward omnipotence seem, in that moment, almost sensible. Almost. Almost, because there is also a shadow economy that revolves around these Chinese ports and probes at the discordant edges of its homogenizing fantasies. Outside, on the “shore side” of a ship at berth, one beholds the fearsome fury of cargo soaring into the sky and being placed on an endless rumble of trucks. But a walk around the other side of the ship to its “sea side,” where starboard faces the quieter harbor waters, quickly reveals a different kind of marketplace. An entire industry has risen to ‘manage’ the mass metabolism of waste that constantly threatens to overwhelm the ship, a grand string of waste workers, small businessmen, garbage disposal trucks, and sludge barges that emerge from the peripheries of the port to help the ship clear its bowels after its weeks at sea. On Ever Cthulhu’s starboard, a constant supply of barges and cleaning operators come alongside the vessel in the afternoon, tasked with pumping dirty fuel out of tanks, collecting mountains of accumulated garbage and scrap, and cleaning out used pipes. 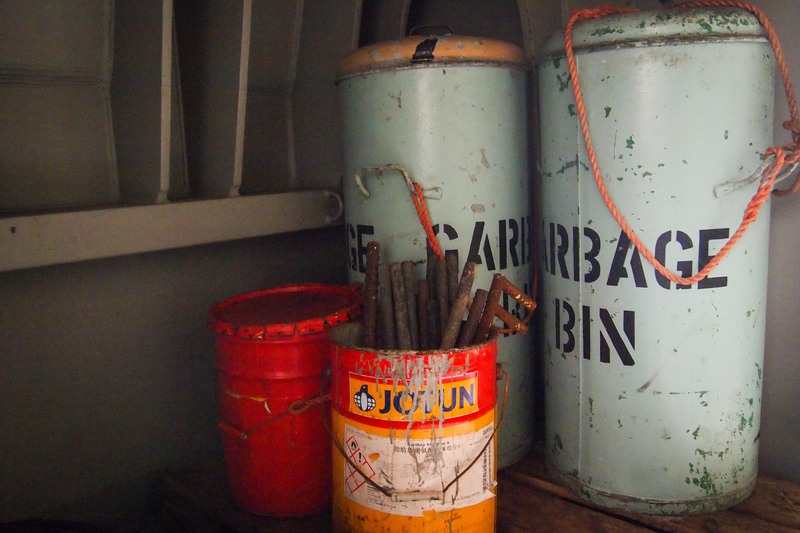 Waste is a direct product of the logistical system: produced by it, but also a threat to it. Lean logistical models of Just-In-Time production aim precisely at eliminating waste: under its rubric, anything that is not in motion detracts from the circulationist philosophy of “seamless flow”, and is regarded as refuse. In fact, geographers Vinay Gidwani and Rajyashree Reddy place waste at the heart of narratives of modernity: Acting as society’s “external margin” – that which it constantly desires to cast out – the problem of waste valorizes “a certain conception of the modern subject” who, in productively and fruitfully mixing his labor with the land, proves himself able to engage and overcome the problem of wastage. ‘Waste’ is the political other of capitalist ‘value’, repeated with difference as part of capital’s spatial histories of surplus accumulation…The travels and perils of waste give us a ‘minor’ history of capitalist surplus accumulation – the things, places, and lives that are cast outside the pale of “value” at particular moments as superfluity, remnant, excess of detritus; only to return at times in unexpected ways…Waste, then, is a material excess that is unruly and improper: disordered matter, or matter out of place…It is also the specter that haunts the modern notion of ‘value’. Gidwani and Reddy show that in engaging ‘waste’ as an enemy to be conquered and overcome, capitalist surplus circulates through a complex network of recalcitrant human and nonhuman connections, in the process bringing the production of value into unexpected confrontation with its simultaneous production of waste. Perhaps the starkest portrait of the ways in which material excess haunts the logistical world and the human lives around it has been my encounter with tank cleaners in Kaohsiung. The Ever Cthulhu, under recent international regulations to conform to energy efficiency standards, has been undergoing a series of conversions to prepare for the energy shift from heavy fuel oil to diesel consumption. 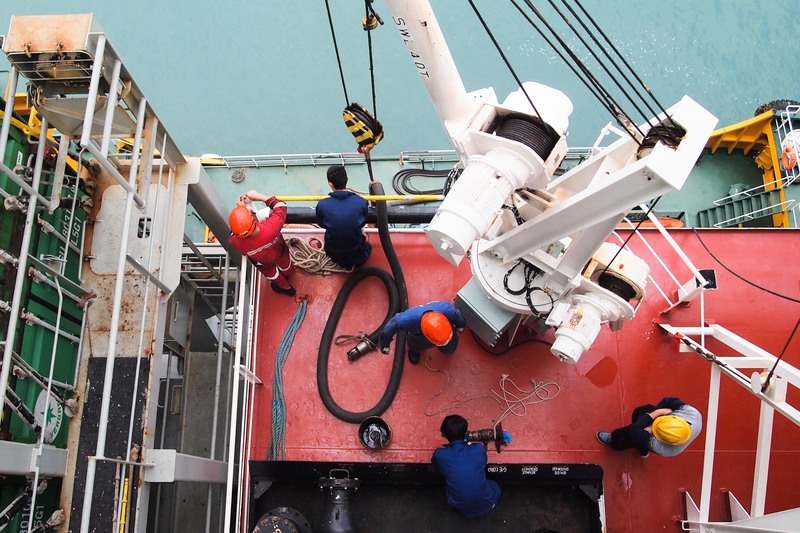 One of those projects has been to clean HFO sediment and residue from one of the ship’s 608 cubic meter bunkers to convert it into a diesetl tank – a filthy, arduous task outsourced to an engineering company in Kaohsiung. Shortly after berthing in the port, I watched fourteen old women – the only other females I have seen during this 42-day journey – clamber up the gangway and set themselves to work in the depths of the ship’s passageways cleaning heavy fuel residue from the tank. When I asked if I could enter the tank to observe, I was very quickly refused. “It is far too dangerous in there,” the captain explained. “Very toxic.” Nevertheless, as I found out from the invoice later on, those fourteen women spent the afternoon in its noxious bowels, removing 4 cubic meters of oil mud through a pump, then wiping the tank walls clean with rags, collecting them in bags, and pulling these out hand by hand. I don’t know how much these oil cleaners are paid (I am on a mission to find out), but as I walked past them on a break, dressed simply in long-sleeves shirts and baggy pants, I noticed the women wore barely any protective gear. They had rudimentary facemasks and gloves, but that was the extent of it. Some were bent over from old age, some wheezed and coughed, others were wiping residue from their eyes. In mandarin, I asked one if she felt the effects of her job on her health. “Coughing all the time,” she told me, “And some nights I wake up because it is too hard to breathe.” She doesn’t know whether these problems have been caused by her daily exposure to toxic oil tanks. I have no doubt: Even in few afternoons I have spent with the substance, I could feel the effect of its toxins on my skin, in my eyes, and on my breathing. These women work with HFO every day, a substance that includes traces of mercury, aluminum, and other toxic chemicals. From their look and tone, they are middle-aged to elderly members of the urban poor. The Chief Engineer has said that whenever he has had to order a tank-cleaning job, people who look to be of the lower social classes have carried it out. Sometimes, he has noticed that the foremen bark at them like dogs. I suspect these older women take the jobs because they may not have much of a choice. I certainly expect that they are very low-waged jobs. I did not manage to ask the woman whether she earned enough for medical fees to consult a doctor before she had to return to her cleaning shift. In the evening, they slipped away before I noticed, and I lost the chance to find out more. As Gidwani and Reddy argue, one of the tendencies of the urban present, deeply engaged with the annexation of waste, has been “the emergence of a strange geography of encounters and contact zones within which differences – but also new forms of ‘intimacy’ between the urban middle class and urban underclass are being produced.” While these encounters have increased, however, it has seemed to me that disengagement rather than intimacy has been the result of these episodes of contact, so far apart are the worlds in which various workers labor. This thought has haunted me as I’ve walk around the ship in the east Asian ports talking to lashers, foremen, pilots, welders, watch salesmen, safety inspectors, and cleaners — a motley crew of the logistical supply chain, a whole jumbled mass of labor, some regarded as the refuse and scum of the working classes, others skilled elites. Most, when asked, find barely any connection between their work and that of others in the industry, and even when peopled together on one (albeit enormous) ship, interact only briefly before going on their own ways again. We can, in this sense, approach “waste” as something that comes to connote not only material detritus, but also the immiseration of labor. We know of capitalism’s tendency to waste human life: Marx reminds us in Capital Volume 1 that, under the “General Law of Capitalist Accumulation”, capital is involved in the systemic production of entirely economically redundant populations. These surplus populations become reserve armies of labor, ready at hand to be subjected to highly differential logics of exploitation and precarity – a dimension David Harvey has aptly named the “factory of fragmentation”. In the past six weeks on board the Ever Cthulhu, even in this microcosm of the vast logistical horizon, I have seen multiple ways in which capitalism draws from a logic of sheer economic wastage: social life is torn apart by market forces, labor power becomes increasingly devalorized, jobs are moved elsewhere, livelihoods are lost, and human lives torn asunder. Recognizing capital’s tendency to eliminate its unwanted components, Adem’s metaphor aptly aligns material waste with wasted life. As a generalized social situation of precarity, the idea of “wasted lives” – a term Zygmunt Bauman uses to refer to the increasing economic redundancy of young people in core capitalist countries – forms a unifying condition which draws lines of connection between variegated forms of individual and social suffering under capitalism. Yet, waste does not go away on its own: it haunts us with its refusal to be eliminated. It must be reckoned with, recycled, and disposed, often in ways that inconvenience capital’s aspirations to ceaseless accumulation and reveal the shadow recurrence of other surprising vitalities. Perhaps all this seems tangential to the logistical apparatus, perhaps even romanticized, but I like to think that following the trail of trash offers a whole other narrative for logistical life: one that looks for the afterlives of capitalist surplus in the ash and filth that it churns out in its path of destruction. Where mammoth logistical economies rise, so too do its unruly remainders. And if we peek around the corner to the quieter side of the harbor, perhaps we can start to envision an entire history written from the standpoint of capital’s unwanted other.